The Agency For Toxic Substances And Disease Registry, ATSDR, is a U.S. Federal agency. Their mission is to prevent exposure and adverse human health effects and diminished quality of life associated with exposure to hazardous substances from waste sites, unplanned releases, and other sources of pollution present in the environment. ATSDR is an agency of the U.S. Department of Health and Human Services. 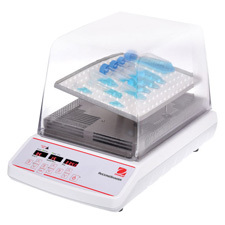 Safety Emporium has all kinds of lab equipment such as this incubating rocking shakers and more. Assess the presence and nature of health hazards at specific Superfund sites. Help prevent or reduce further exposure and the illnesses that result from such exposures. Expand the knowledge base about health effects from exposure to hazardous substances. Conduct public health assessments at RCRA sites, when requested by the Environmental Protection Agency (EPA), states, or individuals. Assist EPA in determining which substances should be regulated and the levels at which substances may pose a threat to human health. Additional responsibilities in the areas of public health assessments, establishment and maintenance of toxicologic databases, information dissemination, and medical education. ATSDR ToxFAQsTM - Questions and answers about exposure to hazardous substances found around hazardous waste sites and the effects of exposure on human health. Includes 185 plain-English fact sheets. Toxic Substances Portal with links to all available information on a variety of common toxic substances. CERCLA Priority List of Hazardous Substances is not a list of "most toxic" substances, but rather a prioritization of substances based on a combination of their frequency, toxicity, and potential for human exposure at NPL sites. Minimal Risk Levels for Hazardous Substances - A substance-specific estimate of the daily human exposure to a hazardous substance that is likely to be without appreciable risk of adverse noncancer health effects over a specified duration of exposure. Hazardous Substances Emergency Events Surveillance (HSEES) collects and analyzes information about acute releases of hazardous substances and threatened releases that result in a public health action such as an evacuation. Public Health Assessments - Lists, by region of the U.S., the public health assessment at each of the sites on the EPA National Priority List. Very useful if you live or work near a chemical facility/plant. 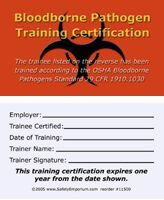 Get your bloodborne pathogen safety materials from Safety Emporium. ATSDR maintains information that may clarify, supplement, or extend the information found on SDS's and is an excellent resource for those who wish to investigate further the nature and effects of a hazardous substance. Almost all of this information is available on the web, so be sure to take advantage of this resource! Visit the U.S. Centers for Disease Control and Prevention. NCEH/ASTDR Priorities as well as the ATSDR Mission, Vision, and Impact. Entry last updated: Saturday, February 10, 2018. This page is copyright 2000-2019 by ILPI. Unauthorized duplication or posting on other web sites is expressly prohibited. Send suggestions, comments, and new entry desires (include the URL if applicable) to us by email.